Loganair is set to compete head-to-head with Flybe and Eastern Airways on some Highlands and Islands routes. Flybe said on Tuesday it was forming a new alliance with Eastern following a breakdown in its partnership with Loganair. The move will see Eastern operate a number of routes Loganair has flown under Flybe livery for eight years. They include services from Edinburgh, Aberdeen and Glasgow to Sumburgh, Shetland. The other routes which Eastern are due to start running on 1 September are between Kirkwall and Aberdeen and between Glasgow and Stornoway. Loganair said it was "extremely disappointed" by the announcement, but said it was "up for the fight". Flybe, which is due to end its current franchise agreement with Loganair at the end of August, said a new five-year deal would see Eastern run its scheduled network under the Flybe brand. 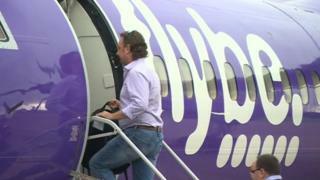 Flybe said the new alliance would "significantly improve" connectivity for Scotland. Chief executive Christine Ourmieres-Widener said: "This alliance with Eastern Airways is an excellent opportunity to strengthen the Flybe network. "We already operate flights at a number of common airports and this will enable passengers to connect to a greater number of destinations, across the UK and into Europe, all booked through Flybe.com." Eastern Airways chief executive Richard Lake said: "This alliance will benefit both airlines as not only does it strengthen Flybe's network, but broadens our distribution and enhances connection opportunities for our customers through its global airline association. But Loganair managing director Jonathan Hinkles said: "We are extremely disappointed and surprised at this announcement. "We have been negotiating in good faith with senior Flybe staff about a continuing codeshare relationship to ensure that customers can access ongoing connections from all of Loganair's extensive Highlands and Islands network to the rest of the UK. "Flybe's decision means it will no longer be possible to book many of these connecting flights in a single booking, adding cost and complexity for the customer. "Flybe is intent on challenging us head-to-head on a few of our traditional and established routes that make up our extensive network in Scotland, but we are 'Scotland's Airline', and I can promise them that we are up for the fight. "We've invested a huge amount in the infrastructure - engineers, ground handling, support staff - to provide our Highlands and Islands services and we're here to stay."